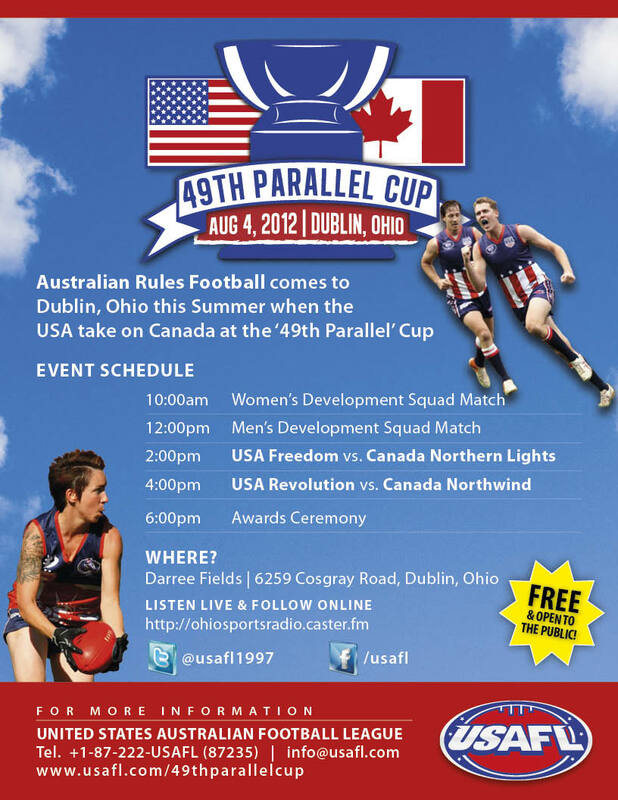 The USA will take on the Canadian's at this year's 49th Parallel cup in Dublin, Ohio. The tournament, to be played at Darree Fields Park, will consist of 4 games during the day beginning with women's and men's development squad games followed by the USA Freedom vs. Canada Northern Lights and then the USA Revolution taking on the Canada Northwind. Go to OhioSportsRadio.caster.fm on the day of the Tournament to listen LIVE to Cincinnati Dockers commentators, Brian Reiss and Lee Mowen giving a play-by-play of all 4 games! Dublin is located on the outskirts of Columbus, Ohio. The nearest airport is Columbus (CMH). The City of Dublin will also be hosting their 25th Annual Irish Festival over the same weekend which players will have the opportunity to experience after the tournament.